Bake My Day! : Presenting the Bread Baking Babes and their Buddies! Presenting the Bread Baking Babes and their Buddies! The modern kitchen table may look just like grandma’s except for that laptop sitting next to the coffee cup. Through the magic of Instant Messaging and Skype all of us are chatting over coffee at the kitchen table, baking bread. All our different houses, all our different kitchen tables, same group. You know; a bit like these communities in earlier Europe where all the women of the village bake their bread on one day, share the communal oven, meet at the hearth, gossip and teach each other, sharing their knowledge. Some of us have known each other for different times; some of us have even met in person. Our experience with bread baking may vary but we all share a great passion and fascination for bread at the moment. And so once a month you can find us together in one of our kitchens: yakking, baking and laughing. A Fridge Full of Food (Glenna, Alumni Babe), Bake My Day (Karen), Cookie Baker Lynn (Lynn),I Like to Cook (Sara), Living on Bread and Water (Monique), Lucullian Delights (Ilva), My Kitchen in Half Cups (Tanna), Notitie van Lien (Lien), The Sour Dough (Mary aka Breadchick),Thyme of Cooking (Katie), Canela and Comino (Gretchen). 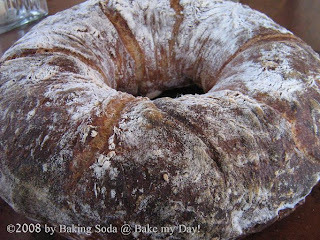 Our first combined effort in February 2008 was a bread in the "wet dough spectrum"; specifically the Royal Crown Tortano. (Recipe Maggie Glezer’s Artisan Baking) Characteristics of this bread are a mild pre-ferment, the addition of a small amount of potato in the dough, very very long rising time but little handling of the dough, using the tiniest amount of yeast to produce a deep dark brown crusty loaf of bread. You can find the recipe in English at Mary's. 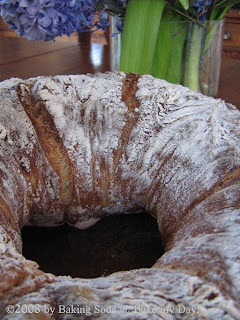 I've made this bread several times and already posted the recipe in Dutch and talked about the bread here and here. Since this bread we've baked up a storm. 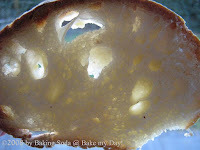 Different recipe each month, each with their own characteristics exploring bread in the broadest sense. 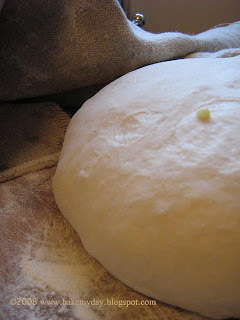 Either wet or firm, made with sour dough, sweet, savoury, steamed, rolled or shaped in any possible way. To sample what we baked click the label Bread Baking Babes. Now.. don't think that's all! We have the name, we have the logo but we're not keeping it all to ourselves. No, any one of you can join if you like and make the recipe we feature, in the week following our posts. We'll be happy to follow your adventures and grant you a Baking Buddies Badge. The Kitchen of the Month will post the recipe and you'll find any information about due date for posting in their post. We bake each month, each month in a different Kitchen. Email The Kitchen of the month with your name and the link to the post, or leave a comment that you have baked the bread.